Hey folks! 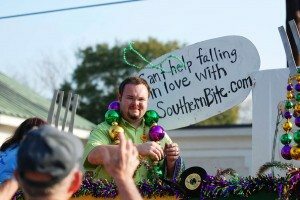 The first of the Mardi Gras parades have begun and carnival season is upon us. 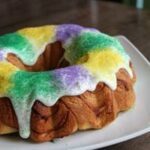 A few weeks back I posted a recipe for a Mardi Gras King Cake that was a little more traditional and quite a bit more involved. This one, though, is super easy and will allow you to put some Mardi Gras color on your table in no time. 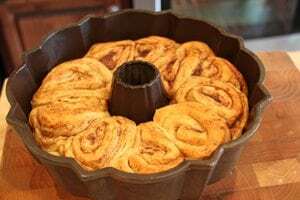 Using prepackaged cinnamon rolls, this recipe isn’t quite as authentic, but it does the trick and tastes great! It’s great for a fun breakfast too. Preheat your oven to 350 degrees and spray a Bundt or tube pan with non-stick cooking spray. 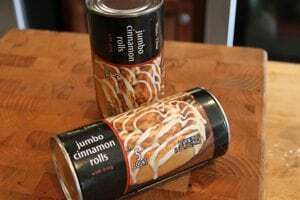 Pop open the cinnamon roll tubes and remove the icing. Then line the bottom with the rolls. You may have to squeeze them in there. 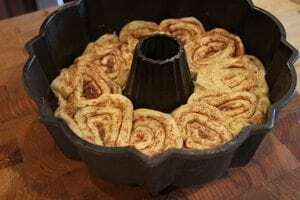 Bake for 25 to 30 minutes or until the cinnamon rolls are no longer gooey. Turn out onto platter to cool. In the meantime, mix the two icing packets with 2 ounces of softened cream cheese. Once the cake is cool, spread the icing and decorate with alternating sugar colors. Preheat your oven to 350°F and spray a Bundt or tube pan with non-stick cooking spray. WOW! You’re the King of Mardi Gras King Cakes. This is the best I have ever found. SUPER EASY!!! 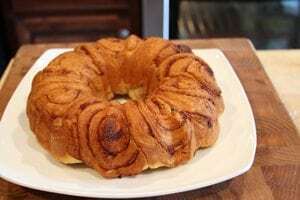 I love this recipe and even though I don’t like cinnamon I am sure to try this! The food look delicious. Will you share the ingredients and where can we buy them? ok sooo I’m a bit of a newbie in the kitchen (oh Lordy) but when/ how do you add the baby? I’d just cut a hole somewhere after it’s cool, insert the baby, and then cover that spot back up with extra icing and sugar crystals. 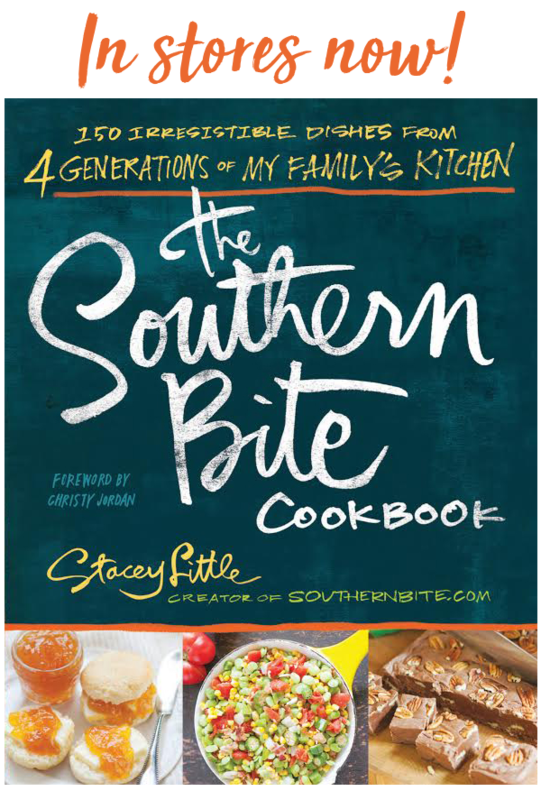 Your cookbook arrived Friday…but before that I had stumbled upon your site and found this recipe….going to give it a try for tomorrow nites “girl” get together. We love to try different foods from around. Some of us that meet at this once a month gathering are transplant from the north, retired military, and good ole southern ladies (GA peach here). 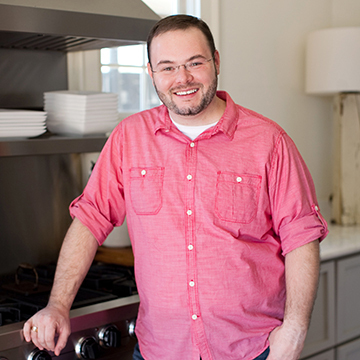 Can’t wait to tell them all about your site and cookbook. Hi Gerri! Thanks so much for your support and for sharing the word! Y’all enjoy! I can’t wait to try this beautiful King Cake, but what about the baby Jesus…..isn’t He supposed to be hidden in the cake? 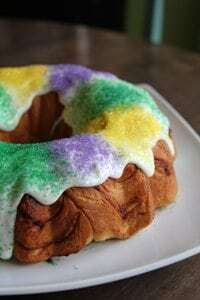 A few years ago I bought a package of 500 King Cake “babies.” I really like this easy King Cake recipe … it should help to crank out King Cakes as fast as possible. I only need 423 more. could you send me one? 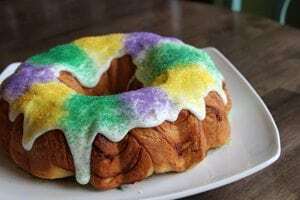 I forgot to get some and I’m making King Cakes today, lol. Can’t this be made a day in advance?